For the 24 hours to 23:00 GMT, the AUD rose 0.27% against the USD and closed at 0.7084 on Friday. LME Copper prices rose 0.02% or $1.0/MT to $6410.0/MT. Aluminium prices declined 0.3% or $5.5/MT to $1868.0/MT. In the Asian session, at GMT0400, the pair is trading at 0.7113, with the AUD trading 0.41% higher against the USD from Friday’s close. 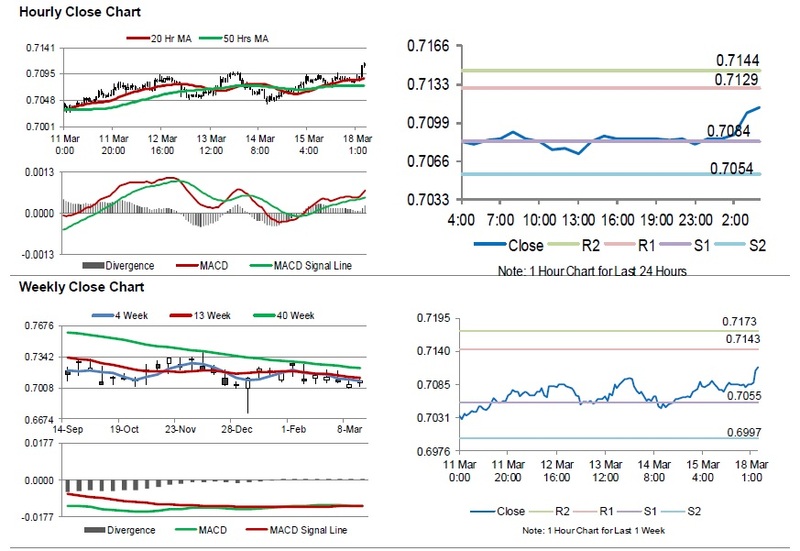 The pair is expected to find support at 0.7084, and a fall through could take it to the next support level of 0.7054. The pair is expected to find its first resistance at 0.7129, and a rise through could take it to the next resistance level of 0.7144. Going forward, traders would await the Reserve Bank of Australia’s March meeting minutes along with Australia’s house price index for 4Q, both slated to release overnight.